Spend the holidays with your favorite sitcom stars as Antenna TV, Tribune Broadcasting's multicast broadcast network airing in 131 TV markets across the US, reaching 86% of TV households, airs holiday episodes and themed marathons throughout the season. Each Saturday night in December (Dec. 2, 9 and 16) leading up to Christmas weekend, Antenna TV presents "Merry & Bright Saturday Night," a primetime block of holiday-themed episodes featuring old favorites and new Antenna TV shows from 7-10pm ET. Along with classic Christmas episodes from All in the Family, Maude, The Jeffersons and Welcome Back, Kotter, viewers will get a sneak peek at some of the funny and bright new shows coming to Antenna TV in 2018, including holiday episodes from Alice, Growing Pains, The Hogan Family, Head of the Class and Murphy Brown. Then from Dec. 23-25, snuggle up with a cup of hot cocoa and your TV remote, Antenna TV is bringing you three full days of classic TV shows celebrating the holiday season. It all starts at 1pm [ET] on Saturday, December 23 with "Christmas Through the Years," where you can see a holiday episode from Antenna TV's library of shows in chronological order from 1954 to 2002. Then at 2:30pm [ET] on Sunday, December 24 and continuing through Christmas Day, viewers can watch a "Classic Christmas Collection," featuring many more of Antenna TV's classic holiday episodes. Included in the collection will be the 1951 film classic, A Christmas Carol, 12am ET and the overnight television tradition of the Yule Log, 5am ET which features a crackling fireplace and soothing Christmas music. 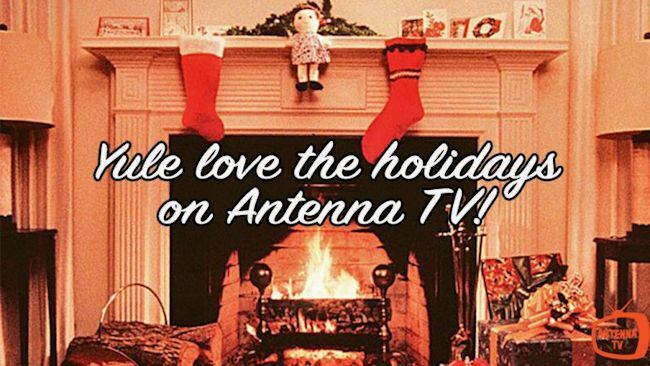 Make Antenna TV your home for the holidays! Stay with us VERY soon for the January 2018 schedule! Two series are coming back to HBO this winter. The HBO comedy series Divorce and Crashing will return with back-to-back season premieres Sunday, Jan. 14, starting at 10:00 p.m. (ET/PT). Divorce, starring Sarah Jessica Parker, kicks off its eight-episode season Sunday, Jan. 14 at 10:00 p.m. ET/PT. Season two finds Frances (Parker) and her ex-husband, Robert (Thomas Haden Church), dealing with the aftermath of their explosive separation and learning to rebuild their lives. The show also stars Molly Shannon, Talia Balsam, Tracy Letts, Sterling Jerins and Charlie Kilgore. The series was created by Sharon Horgan; season two is executive produced by Jenny Bicks, Sarah Jessica Parker, Alison Benson, Sharon Horgan and Aaron Kaplan. Jenny Bicks serves as showrunner. Crashing, created by and starring Pete Holmes, returns for its eight-episode second season Sunday, Jan. 14 at 10:30 p.m. ET/PT. Feeling lost in the universe, Pete (Holmes) has an enlightening conversation with an atheist, which sends him into a night of New York debauchery. This marks the beginning of a new season in which Pete starts to question his faith and find his voice. The series is executive produced by Pete Holmes, Judd Apatow and Judah Miller; co-executive producer, Igor Srubshchik; supervising producer, Oren Brimer; producers, Josh Church and Dave Rath.